It started as an idea, as many businesses do - a spark of heartfelt inspiration. In December 2010, Krysten Aldridge and Ann Cabano hit the streets of downtown Phoenix to find folks in need of a hug and a cup of soup… what they ended up witnessing was way beyond what they expected. As the two women walked around Phoenix that day, they were amazed by something that they couldn’t quite put their finger on. It was something they never felt before; it was big, it was beautiful, it was tragic. They began to document what they were witnessing on video. People, mostly homeless, approached them and asked what they were doing, asked if they could be part of the video. Krysten and Ann turned the camera and people quickly began to share their stories. The truth they heard from people shifted their perspective. They learned how and why the people wandering the streets of Phoenix were homeless. They learned about their families, their forgotten dreams, their fears. Most importantly, they learned about how these unique souls experienced love. And they knew they couldn’t just sit back and observe through the lens of a camera. Krysten and Ann began to dig into how love can change a person’s life, no matter their situation. These two women started to unearth and unfold people’s stories. This is how their non-profit organization, ONe TRUe LOVe (OTL), was born. Initially, ONe TRUe LOVe was going to be a documentary. When Krysten and Ann realized how powerful the message of love resonated in every human being, no matter their position in life, they knew they had to do more. Over the next few years, ONe TRUe LOVe transformed into many things, and they realized the type of impact they were making within the community. They knew the biggest part of their mission was to feed people, not just physically…mentally and emotionally too. 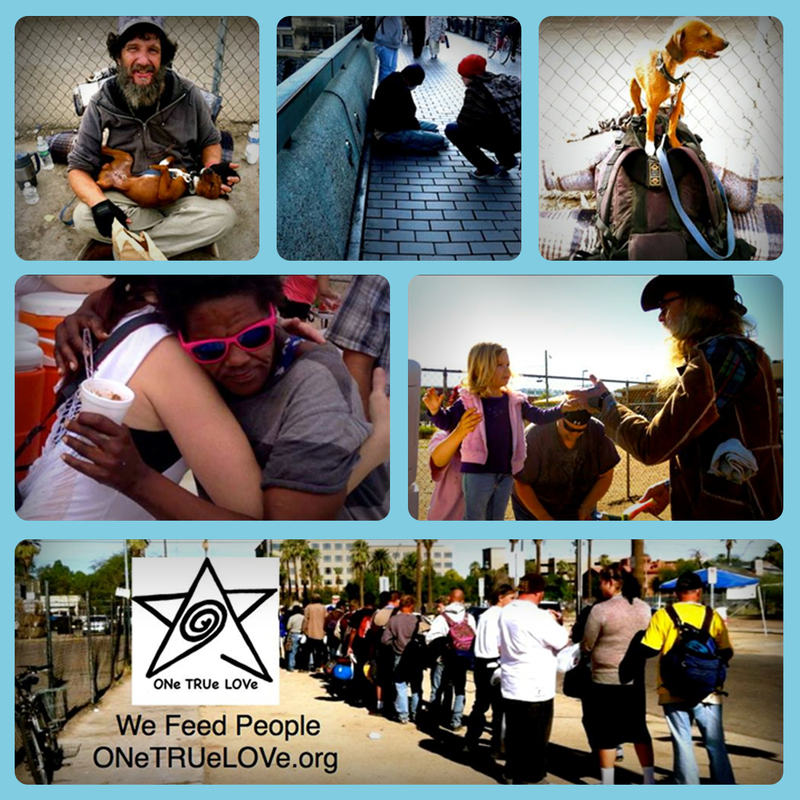 Today, ONe TRUe LOVe is a trusted source of support for homeless people in the Phoenix area and surrounding cities. The organization and its 1600+ volunteers provide food and other resources to the local homeless population. As graduates of Southwest Institute of Healing Arts (SWIHA), Krysten and Ann took the entrepreneurial skills and experience they developed during their time as students and created a successful non-profit business. They both graduated from SWIHA’s massage program, however, it was the Life and Spiritual Coaching skills that they bring into their work with OTL every single day. “We are taking the skill of meeting people where they are at and really applying that principle to our friends on the street,” Ann says. “Our Life Coaching skills also apply to our volunteers and our mission in general. Reading the energy of people, hearing what is NOT being said, offering what people ask for without imposing what they have not asked for.” Ann also became an ordained minister through SWIHA, and has prayed with countless people she’s met through her work with OTL, offering blessings of hope, protection and strength. Building OTL took time, effort, and definitely a lot of love. Ann and Krysten say launching the organization was easy once they began to follow the guidance of their heart. “It just made sense to help people,” says Ann. Since starting OTL, the women and their volunteers have stayed committed and strong. 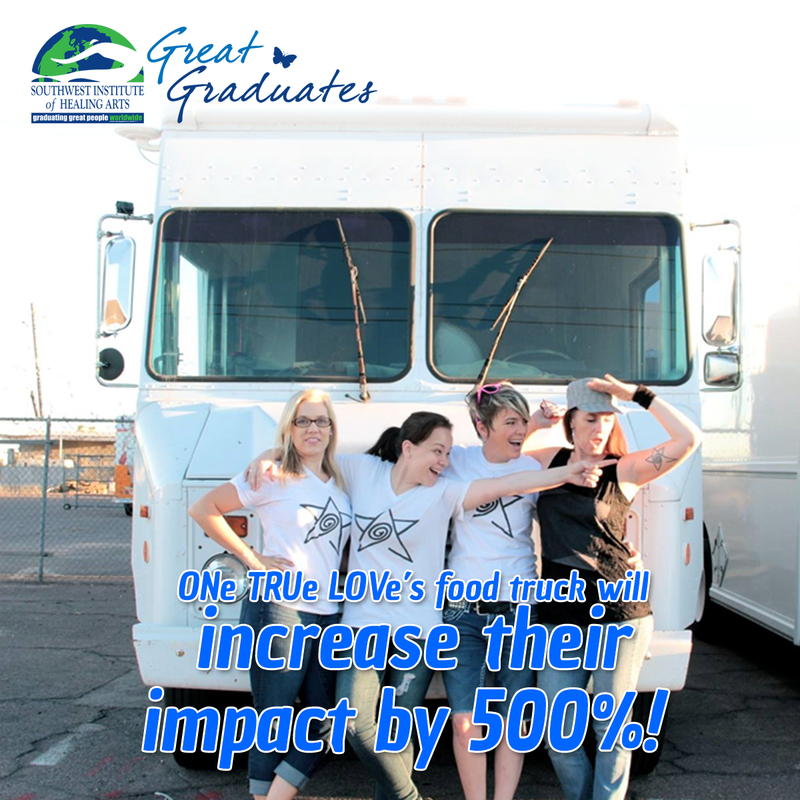 This month, they are proud to announce that ONe TRUe LOVe will increase their impact by 500 percent through the purchase a food truck. As a non-profit organization, they intend to participate in the Tempe, Phoenix and Gilbert food truck circuit operating as a “pay-as-you-can” model, the first of its kind in Arizona! 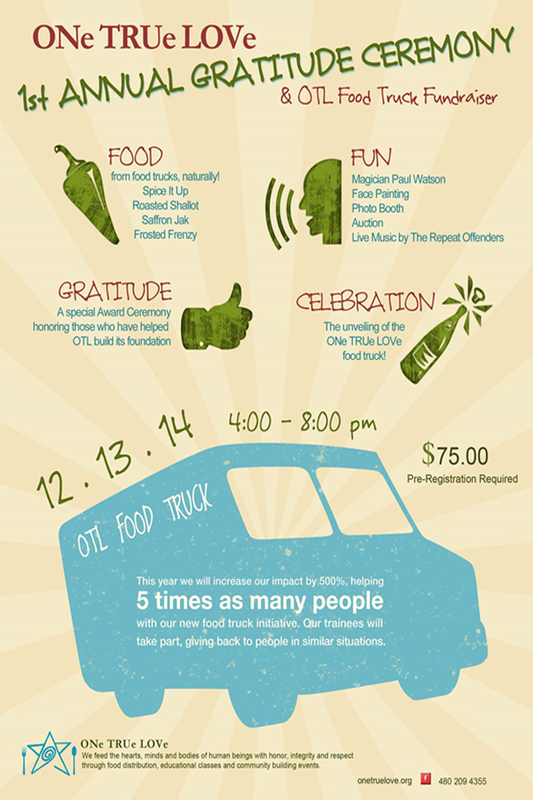 On December 13th, 2014, they will unveil the truck at OTL’s first annual Gratitude Ceremony. The Gratitude Ceremony fundraiser will be from 4:00 pm to 8:00 pm. Tickets are $75 and can be purchased online; the location of the event will be revealed when the ticket is purchased. Activities at the fundraiser include tastings from four of the Valley’s hottest food trucks, a stage show from magician and hypnotist Paul Watson, live music from local cover band the Repeat Offenders, and activities for the entire family, including face painting, a live art exhibition and photo booths. There will also be a silent auction with prizes ranging from gift cards from the four local food trucks, local artwork, classes, gift baskets and even a Playstation 4! For more information and to purchase a ticket, please visit ONe TRUe LOVe. On December 21st, Southwest Institute of Healing Arts will host a Winter Solstice Celebration dance with ONe TRUe LOVe, put on by Phoenix Sunday Dance. Tickets are $15, however, no one will be turned away for lack of funds. All proceeds will go to ONe TRUe LOVe. To learn more about volunteer opportunities with ONe TRUe LOVe or for more information about the organization’s upcoming events, please visit their volunteer page or their Facebook page.